Caddo Indians occupied the Nacogdoches area as early as 1200 A.D., settling along Lanana and Banita creeks, names given to these streams later by Spanish settlers. The Caddo lived in huts made of limbs lashed together and covered with grass. They gathered the natural bounty of East Texas’ forests and streams and established elaborate trade relationships with other Indians. Nacogdoches remained a Caddo Indian settlement until 1716. At that time Domingo Ramon established five religious missions and a military presidio in East Texas, including Nuestra Senoria de Guadalupe de los Nacogdoches del Pilar. That was the first European activity in the area, but a mission was not a town — it was a church. The mission struggled until strengthened by the Marques de Aguayo in 1721, but even then it endured more than prospered. The “town” of Nacogdoches was established after the Spaniards decided that the French were no longer a threat and that maintaining the mission was far too costly. After France ceded claims to lands west of the Mississippi River to Spain in 1763, Spain’s New Regulation of the Presidios required all settlers and priests in Eastern Texas to withdraw to San Antonio. Some were eager to escape the wilderness, but others had to be forced from their homes by soldiers. 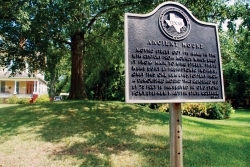 Take a tour of more than 70 Texas State Historical Markers, including Ancient Mound, Chas. Hoya Land Office, Zion Hill Baptist Church Cemetery and Site of the Mission Nuestra Senora de Guadalupe — a Spanish outpost founded in 1716 as a means of civilizing and christianizing the Nacogdoches Indians.